⇒ How to enable Cookies || For all browsers || Easy & FREE guides! How to Enable and Disable Cookies? This section will tell you how to enable cookies and also how to disable them, too. The process for enabling or disabling them will vary depending on the browser you are using since cookies are maintained by your web browser. 1. Open your browser and click on the drop down menu. Click Settings. 4. Under Cookies, tick the Allow local data to be set option and click Done. 1. Open your Internet Explorer browser and click on the gear icon. Click Internet Options from the drop down menu that pops out. 2. Under the Privacy tab, click Advanced button under Settings. 3. Tick accept on both options and tick Always allow session cookies if it is still disabled. Click Ok when you’re done. 1. 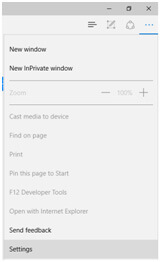 Open your Microsoft Edge browser and click the menu button that resembled this symbol “…”. Click the Settings option at the bottom of the drop down menu. 2. Scroll down to find Advanced Settings and click View advanced settings. 3. Scroll down to find Cookies and select Don’t block cookies among the options available. Refresh your browser. 1. 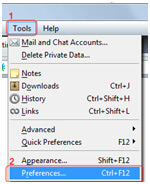 Open your Firefox browser and click the drop down menu. Click Options. 2. Go to the Privacy Tab and find the History section to change the command for Firefox will: from Remember history to Use customer settings for history. 3. 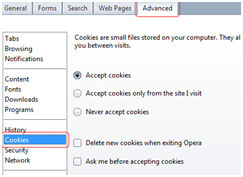 Tick the Accept cookies from sites box and set the Accept third-party cookies to Always. Refresh your browser. 1. Open your Opera browser and click Tools. Click Preferences. 2. Go to the Advanced tab and tick the Accept cookies option. Click Ok.
1. Open the Safari web browser and click on the drop down menu on the upper right corner. Click Preferences. 2. Go to the Privacy tab and tick the Never option under Block cookies to allow all cookies to be enabled. Close the window and refresh your browser. 3. Done. Your Safari web browser can now access cookies. What Is This About Enabling Cookies? Cookies are a standard part of the internet and running a website these days, which makes learning about them worthwhile. For web managers, learning to enable cookies and knowing why they are doing this in the first place is important if they want to make the most out of the feature. You could still run a website without knowing or doing anything you read here, but they would definitely be helpful. For users, the information you find here will help you decide whether cookies are good or bad. Cookies are basically little pieces of code that are meant to do specific things based on how they were programmed. Most cookies are used to do things like store usernames as well as remember the activities of users when visiting websites. This is useful for both the users and the web managers since it helps save a lot of time and effort. Most of the time, cookies are sent to a user’s computer once a website is accessed. The next time the user visits that website, the platform will connect with the cookies in the user’s computer in order to activate the functionality mentioned above. There are definitely quite a few benefits to using Cookies. For users, the most obvious would have to be the convenience factor. You don’t have to input as many information or backtrack when visiting particular websites. More than that, websites are also better able to cater to your needs in a way that is specific to your preferences. Websites base this on your past actions and activities. For web managers, the benefits become even more pronounced. Not only can cookies help retain users, it also makes things easier when it comes to ad placement and catering to their needs. Personalizing product offers, deals, what ads to show or avoid, and more are possible through cookies. For users, the decision to enable cookies is based entirely on what kind of browsing experience they want. If they don’t want to deal with the hassle of ads and cookies getting plugged into their computers, that’s up to them. Then again, enabling cookies does provide the optimum experience when web surfing. Naturally, web managers would want to enable cookies simply because there is no reason not to. You can always avoid the more annoying programs if you don’t want to bother users with too many cookies, but keeping some is definitely advised. A Flashplayer is a software that is used to stream and view videos and multimedia on a computer or on a mobile device. Adobe flash player is available for desktop platforms including Windows, Mac OS X, Solaris, and Linux. Flash player is also supported by many mobile operating systems such as Apple IOS, Blackberry Tablet OS, and Android. It also supports data and multimedia formats such as JSON, XML, mp3, JPEG among others. Flash player is originally created by Macromedia and later developed by Adobe Systems Inc. Without a doubt, VLC Player is one of the best things to have ever happened in this planet, where people’s lives are practically centered around new downloadable movies and updates on the latest episodes. In today’s world, you can really say that your VLC Player is your best friend. But of course, it might be a little difficult to keep track of all the functions needed for the perfect VLC Player experience. If you think you need a list of all those keyboard shortcuts, you don’t have to look too far. You simply have to click here and you’re well on your way. 1375 visitors rated enablecookies.info/ with an average 4.8 stars out of 5.